The weighted average cost method accounting is a method of inventory valuation used to determine the cost of goods sold and ending inventory. Weighted average accounting assumes that units are valued at a weighted average cost per unit and applies this calculated average to the units sold and the units held in ending inventory. The calculations used in the average cost method depend on whether the business is using a periodic inventory system of a perpetual inventory system. Under the periodic inventory system the average cost method calculations are carried out at the end of the accounting period. The weighted average cost per unit is based on the cost of the beginning inventory and all the purchases made during the period. This average cost per unit is then applied to the units sold and the units held in inventory. The average cost method is summarized in the diagram below which shows the sale of two units. The number inside each unit represents its cost price. 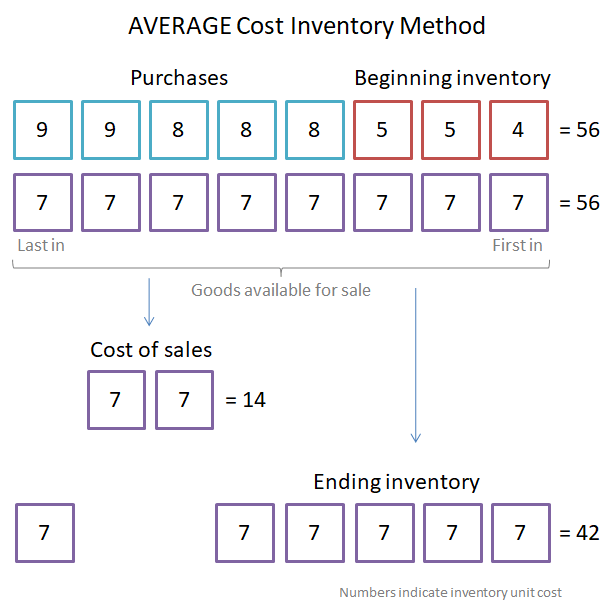 Using the average inventory method the total cost of goods available for sale is averaged and any two units are sold at the average cost. Using a simple average the calculation is as follows. The calculations using the periodic average cost method are summarized in the following table. This weighted average unit cost is then applied to the number of units sold (200) to calculate the cost of goods sold of 1,240 (200 x 6.20), and to the ending inventory of 300 units to give an ending inventory cost of 1,860 (300 x 6.20). It should be noted that the above method refers to the use of a weighted average calculation in determining the inventory valuation. An alternative approach would be to use simple averages. In the above example the simple average of the unit costs would be calculated as follows. The simple average unit cost of 6.33 compares to the weighted average cost calculate earlier of 6.20. The method gives a reasonable estimate of the inventory value when the beginning inventory and purchases are of a similar level. Under the perpetual inventory system transactions are continually recorded and the average cost method calculations are carried out during the accounting period each time a purchase or sale takes place. The weighted average cost per unit is based on the cost of the beginning inventory and the purchases up to the point at which a sale takes place. This approach is sometimes referred to as the moving average cost method. Using the information from the previous example, the calculations using the perpetual average cost method are summarized in the following table. As the business uses the weighted average perpetual inventory system, the purchase and sales need to be dealt with in chronological order and an weighted average unit cost calculation is needed each time a sale is made. As the weighted average is continually calculated, the perpetual inventory average cost method is sometimes referred to as the moving average cost method. Notice that in both cases the total cost of the beginning inventory and the purchases (3,100) is the same, and only the allocation of that cost to the cost of goods sold and ending inventory changes. This is summarized in the following table. The average inventory method is one of the available methods used in inventory management. Clearly the method used to determine which units are sold and which remain in ending inventory determines the value of the cost of goods sold and the ending inventory. As profit depends on the cost of goods sold, the method chosen will affect the profits of a business. Other methods of determining inventory movements included FIFO (first in first out) and LIFO (last in first out).